Chris is a born educator. Even at 12 years old, you could find him teaching others about interpreting nature with a hawk perched upon his arm. His career in outdoor education began roughly there, at the Last Chance Forever Bird of Prey Conservancy in San Antonio, Texas, where he volunteered alongside his family. 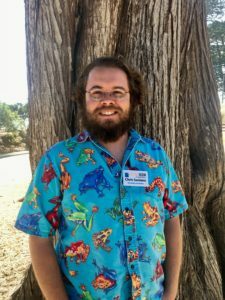 His knack for outdoor education carried him to the San Antonio Zoo soon after, where he helped with everything from animal care and facilities maintenance to educational programming. Chris found his way to the West Coast after graduating from The Evergreen State College in Olympia, Washington, with a B.S. in Zoology and Evolutionary Biology. In California, he worked for The Web Of Life Field School as Naturalist and Program Director. He taught thousands of kids about nature and Earth stewardship, all the while further cementing his love for outdoor education. Today, Chris is the Museum’s Field Programs Coordinator. He leads interpretive programs at Neary Lagoon and Pogonip for school groups, as well as our Earth Stewards Program, which aims to empower the next generation of environmental stewards by providing STEM education to alternative education high school students through outdoor experiences. He creates curriculum for the Museum’s educational programs and delivers classroom presentations for local schools. He’s eager to help program attendees push past their boundaries, meet and surpass the expectations of the newest generation of science standards, and keep comfortable in nature, no matter how distracted their world may become.